If you have been trading your demo account for at least a couple months, chances are you have started using a strategy of your own that combines most of what you have heard and read so far. However, because if its very nature, such strategy will evolve as you keep learning new things. Is it changing for the better? Unfortunately, this is not always the case. Luckily, there is a tool just for you — Forex Tester allows you to fully simulate a live trading account, completely customizing everything from — spread to equity and leverage settings. You can download free historical data of the last 16 years for all the main currency pairs, choose from the vast selection of technical analysis tools and place your orders, watching your equity change as a result of your trading choices. But the best part of all is that, once you have placed your orders, you do not need to wait hours or even days or weeks to see the results, as you are able to fast forward in time to any point in the "future", including your next stop or limit order execution. Needless to say, this is a unique and extremely valid tool to test your strategy manually or automatically, on real data, and in a very realistic environment. You may think your strategy cannot fail, but there is simply no such thing as a Holy Grail in the world of currency trading. Many traders have been looking for a software suite like this for a long time, and many believe that a tool like Forex Tester should be part of every trader's arsenal. Let's take a closer look. You can download a free demo version of the software, which enables you to trade using the full suite of features for about 1 hour before expiring and there is a limit of 1 year for historical currency rate data. In the previous version of Forex Tester, there were two modes, the edit mode, which would let you customize your account from leverage to equity and spreads for each currency pair, and the testing mode where you could effectively test your strategy by placing orders and see your equity rise or fall as a result of your actions. 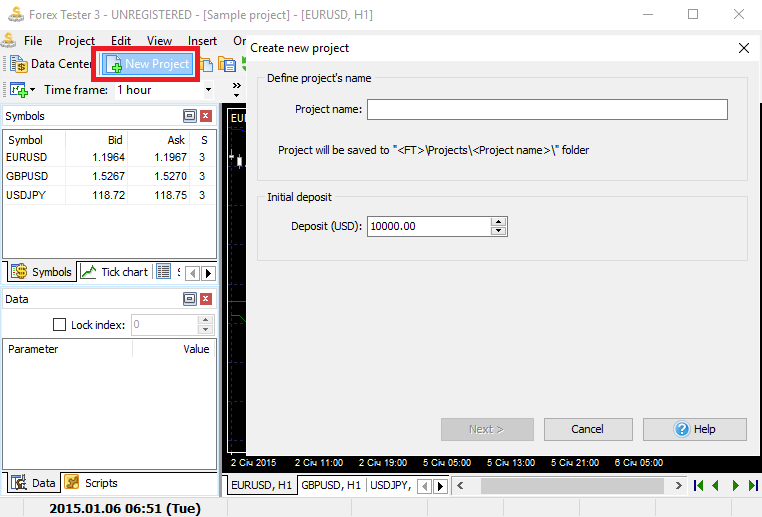 First, you set the project name and the initial account balance. Once you select the currency pairs you wish to trade, the date range to test on, the history data quality level, and the timezone, you are ready to go. Simply start placing your orders, jumping forward in time to the point where you want to close your trade. You can advance one candlestick at a time, or fine tune the speed with a slider conveniently placed at the top of the screen. Everything is like you would expect an actual live account to be, including a good selection of technical analysis tools to help you drive your decisions, a log of all your trades, pending and executed, and a highly customizable user interface. The software comes in two flavors, demo and full. While the latter is a paid one and is quite expensive, it is by far the most useful too, as it allows you to save and reload your account data from previous uses and even to program your own strategy to have it automatically tested, thanks to the powerful API that comes with the software. In the support forum, the developers will answer all your questions and provide you with updates and minor releases to further enhance your experience with this very helpful piece of software. Lets you trade on historical data under very realistic market conditions. Fully customizable: from leverage to a single pair's spread. Extremely useful tool to test your strategies safely without losing money. Fast forward in time and avoid waiting days to see the outcome of your trades. The actual execution of the strategy may differ significantly from broker to broker and may not be the same as in Forex Tester. You can visit Forex Tester website to learn more about its features and download the free trial version.